“Venom” is a movie that, like its lead, suffers from a split identity. For the first half, it wants to be a modern revival of body horror flicks. Its scares don’t come from ghosts jumping out of the shadows, but the extreme discomfort caused by the sight of extraterrestrial goo maliciously attacking and consuming its human prey. But then, at the halfway point, the film very suddenly becomes a goofy buddy comedy, between an alien creature and the human its attached itself to. “Venom” could have been a success if it had decided to fully commit to either genre. But it doesn’t, and the result is a total mess. “Venom” begins with hard-hitting journalist Eddie Brock (Tom Hardy), as he begins investigating the Life Foundation, led by Carlton Drake (Riz Ahmed). Drake’s corporation has made massive strides in creating pharmaceutical treatments for cancer, and additionally creates spaceships to search for potentially habitable alternatives to Earth (even in the era of Elon Musk, the Life Foundation is hard to buy into). Brock, however, has good reason to believe that they’ve been conducting lethal experiments on society’s most vulnerable. His interest in the Life Foundation coincides with their recent capture of several alien organisms, known as symbiotes, who attach themselves to other organisms to survive earth’s oxygen levels. Surely enough, Brock eventually finds himself attached to one of those symbiotes, the titular Venom. For the entirety of its runtime, “Venom” stumbles from plot point to plot point with no sense of rhyme or reason beyond fulfilling the template for superhero movies. Early on, Eddie causes his own personal demise: his fiancée Anne Weying (Michelle Williams) happens to be working as a lawyer for the Life Foundation. The day before doing (what was supposed to be) a puff-piece interview with Drake, Eddie reads Anne’s email, sees evidence of Drake’s crimes, and decides to turn the interview into a confrontation. Naturally, Eddie is fired, given that he screwed up a major interview and couldn’t cite any sources to back up his extreme claims; Anne leaves him, as his stunt has gotten her fired from her job. This sets up a classic plot point of the superhero origin movie: our hero is crestfallen and must spend the rest of the movie rising up. Think back to “Iron Man,” in which Tony Stark is kidnapped, and must forge his own path back home, before eventually facing off against the film’s villain. In “Venom,” we are meant to believe that Eddie’s downfall was the result of being morally righteous in an immoral world. He will then, with the help of his extraterrestrial buddy and their combined powers, rise up against the evil corporate villain that is Carlton Drake, and the symbiote he’s eventually conjoined to. His early downfall, then, fulfills the first part of the template of a superhero origin story. But Eddie’s actions make absolutely no sense. Why would a respected journalist be so irrational as to accuse a powerful man of heinous crimes with so little evidence? Couldn’t he have waited for another opportunity, where he could confront Drake with actual evidence of his crimes? Why risk his fiancée’s job over this? If anything, he absolutely deserves everything that happens to him. But the movie still presents him as a hero in a tragic situation. It’s a major problem with “Venom”: things happen because they’re supposed to happen in these kinds of movies, not because they actually make sense. It’s genuinely infuriating that such a talented cast is wasted on such lazy writing. Ahmed, a remarkably gifted actor, isn’t an intimidating villain, nor a satirical portrait of Silicon Valley billionaires. Instead, his performance resembles a clumsy, B-movie mad scientist. Williams is wasted as a boring love interest who mostly serves to move the plot along (admittedly, her character gets ever-so-slightly more to do than love interests in other films, but that can’t make up for her lack of personality or significant character development) Then there’s Hardy. A terrific performer, he, like the rest of his cast, seems lost within the material, unsure of what to do with it. For the most part, he chooses to embrace the silliness of it all, making weird faces, and throwing himself completely into the absurdity of the role. Not that any of that can make up for his ridiculous New York accent, which comes off as a bad Mark Wahlberg impression more than anything else. Still, he, unlike his other castmates, is at least enjoying himself, a quality which makes the movie far more entertaining whenever he’s on screen. It’s here that I have to be fully honest: while nearly every aspect of it was a scattershot mess, I still (occasionally) enjoyed myself during the runtime of “Venom.” Even if the dialogue was rough around the edges, I enjoyed watching Hardy banter back and forth with his alien alter-ego, if only because Hardy was trying so hard to make it work. 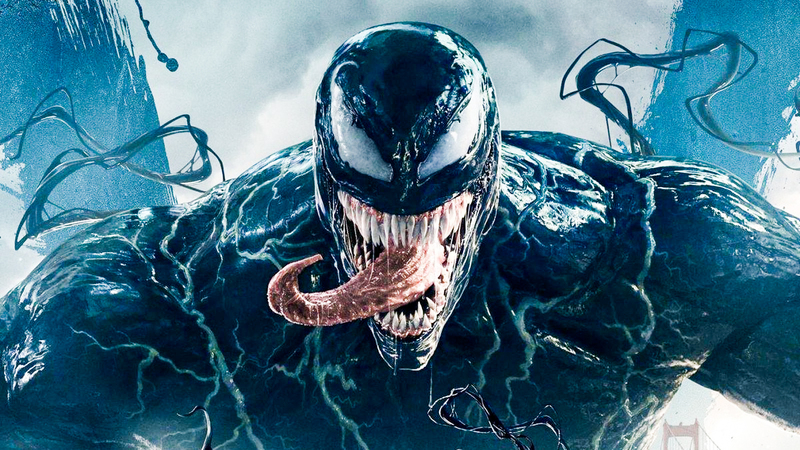 I enjoyed the design of Venom; his freakish size, black skin with white veins pulsing through it, enormous teeth and slithering tongue made for a serviceable movie monster. It was satisfying to see the monster battle his way through SWAT teams and motorcycle chases, even if the editing was choppy. “Venom,” is not a good movie by any means; and what entertainment it offers is fairly minimal. It’s a movie that should have been quite entertaining, given the cast and premise behind it. One can only hope that its inevitable sequel will know what kind of movie it wants to be and correct the mistakes of the franchise’s past. If that sequel turns out to be a marked improvement, then maybe “Venom” is worth watching, if only to catch up for the next one. Otherwise, there’s only so much good to be found in this mess.